Only twice in my life have I exited an airport and been met by someone holding up a name card – Milan, twenty-two years ago, was the first. Under this card I was to meet my wife in a commercial for CartaSi – an Italian credit card company. We got stuck in traffic on the way into the city and she took the opportunity to show the taxi-driver a name on a scrap of paper, asking where it was and how far it was from Milan. About an hour by train, I told her – it was the only time I had seen Sesto Calende written down apart from on my mother’s birth certificate! She went on to tell me of a friend of hers who lived in Sesto and commuted every day to teach English in the city. She had made plans to visit her on her day off from filming, so I asked if she could look in the phone book to see how many Bassettis there were. Pages, she told me on her return. So it was that I extended my stay (luckily we had open tickets, as they didn’t know how long the filming would take) and went in search of my roots. Armed with photocopies of my mother’s birth certificate I headed for the Town Hall, where a friendly clerk said she would do her best and for me to come back the next day… which of course I did. On my way back to the hotel I called in to a photographic shop to pick up some film for my camera. 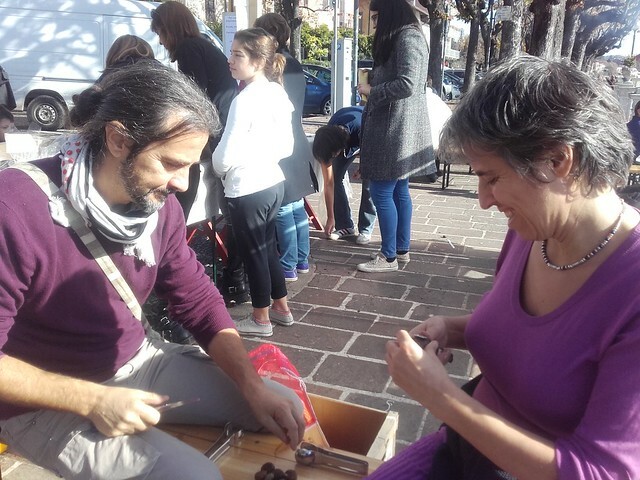 Having served the customer in front of me, the shop owner turned to me and asked me quite abruptly what I was doing in Sesto. I was quite taken aback by his directness and told him so but he just replied saying, well you’re not from Sesto and it’s not the tourist season…so what are you doing here? I told him I was researching my mother’s family whom I’d never met. Ah he said, the man you want is Signor Varalli, the local amateur genealogist and ex-Mayor. Back at the hotel, I asked the manager if she could call the number the photographer had given me and arrange a visit. She was happy to oblige and that afternoon I rang his door-bell and was ushered in by a lovely old man in slippers, who led me into a room, the shelves of which were packed with hand-written exercise books of all the families of the area. Ah, Bassetti he said..una grande familia…. He had meticulously recorded not just births and deaths but professions, where people had moved to and the age of the mothers when they gave birth. In no time, he had located my branch of the family and I was able to fill in a few more details. At the town hall I had managed to photocopy the exact location of the family grave and Sgr. Varalli phoned an erstwhile colleague to ask where it was to be found. At this point his son jumped up and offered to drive me there. We squeezed into his Fiat 500cc and sure enough found the modest gravestone without too much trouble – there were Bassetti tombs the size of a small house – We asked if anyone tended it and were told we’d just missed them…they were here last month, they come every year from Belgium ! I felt that the search was coming to a dead-end but was told if I wanted to get more information I should call by the church, as they have family archives going back many generations. My time was limited so having got no reply from the priest’s doorbell, I headed back to Milan, from where I was able to phone him. Our conversation was very clipped, in part because of the paucity of my Italian but also, I suspected, because I made mention of Sgr Varalli. I think he was of the left and I was reminded of the wonderful stories of Don Camillo and Peppone – which chronicle the small town rivalry between a catholic priest and communist mayor. Jump forward 22 years and here I am again in Sesto, this time seeking an audience with the archivist at the church ‘office’. She only works there on Wednesdays, so I’m going to have to wait til Ruth and I get back from the UK in 12 days time, for the next episode…. Meanwhile Ruth and I had met a lovely group affiliated to a leftist party, who were selling roast chestnuts and home-made pastries down by the lake. On a mission to find water for Emma, I came across the fascinating Gottard Transport Museum, just across the Ticino river, lovingly put together over many, many years. It was run by its 92 yr old founder, his son and grandson with unbridled enthusiasm for anything mechanical and ranged from the bizarre to the frankly ridiculous (see the flickr album). One boat he’d bought had to be virtually cut in half to get under three bridges en route to its final resting place, only to be welded back together again before going on display! Planes, trains, automobiles… combine harvesters, tanks, motorbikes a plenty… even some with machine-guns mounted on sidecars – you name it, they’ve probably got it. We rested for a couple of days before we got going southwards. Time was ticking on and we wanted to go through Switzerland and escape the winter before it got too cold or snowy. We stopped off at an old school friend’s place in northern Bavaria. She and her family had had a year of stressful situations, plunging her husband into a deep depression and instability to the extent that he had to go and spend some time in a clinic. We decided to stop for a few days and to visit him every day, so that we’d have some time to connect with each other. On the last day, we had a wonderful time with him, collecting firewood together, strolling in the park, chatting about many things, exploring the historic part of the building housing the clinic, playing cards in our Emma and really connecting with each other. I have a huge respect for the way that my friend’s husband deals with his situation, and how his family supports him. We travel on to Switzerland, where my brother lives in a little village above one of the lakes. We are very lucky with the weather, catching a glorious couple of days where we enjoy alpine air and views. My brother’s wife Karen takes a day off work and we drive high up to one of the Alps where the cows spend the summer. Karlo and I lounge in the sun on some rolymats (me because of my knee and him because he’s weak from the cancer treatments), while Frank and Karen go for a one-hour walk up to one of the huts. I enjoy the sun and the spacious silence and being able to spend some time with a brother with whom I’ve had precious little positive time in my life. Sometimes, I take an active decision to focus on the things that give energy rather than the ones that take energy. I remember 2 happy moments with my brother in the picture: I was very happy that he and his family made the long trip to Wales to join us at our wedding, and I enjoyed our visit to Karlo in July earlier this year. To this will be added the joyful memories of this visit. 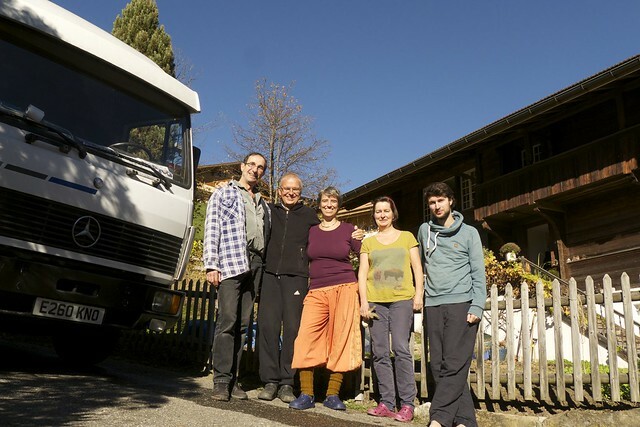 It is great to see Karlo happy in this little and very Swiss village (check out the photos on flikr, it really is the archetypal Swiss village! ), to feel the loving and nurturing care of his wife and the support of his children. They have a lovely house and Karlo is in the process of creating a beautiful garden along the South side. Some neighbours have given him Dahlias, of the dark red and full kind. They are my favourites, I can just imagine how beautiful they will look in this sparkling mountain light. 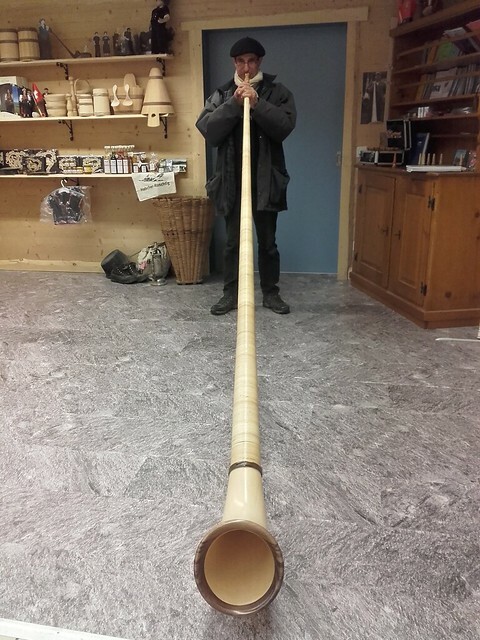 We visit an Alphorn maker in the village and both Frank and I have a go on one of these extraordinary horns. The wood for the instruments all comes from this valley, the instrument maker’s father runs the sawmill. I am very happy to have been shown the beauty of the high Alps, with the stunning views onto snowcovered peaks. The cows are now down in the village, and one evening we go to collect the fresh milk as the farmers arrive at the central house with their individual churns full of milk, and before the big lorry comes to take it all away. That evening, we have a family meal where we are joined by two of Karlo’s children, plus the daughter’s boyfriend, Pascal. The food is exquisite and the laughter and conversation is a delight. Pascal has a great sense of humour, but his witty comments have to be translated first, as I can’t understand a word of his strong Valley dialect. I then translate on for Frank’s benefit, which slows down the conversation but also is the source of much mirth. These are the moments I will treasure.